Can you still collect compensation for a dog bite if you were trespassing? California law specifically allows trespass as a defense against liability for a dog bite attack. This means you may not be able to collect compensation for your injuries if you were truly trespassing at the time the dog bit you. If you're found to be trespassing, your options for compensation for a dog bit is nearly non-existent. 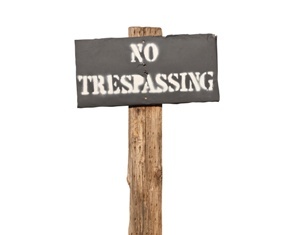 Trespassing is a legal term used to refer to entering private property without the express or implied permission of the owner or person who lives there. In regards to a dog bite attack, a victim is considered to be lawfully on a property if he has express or implied permission to be there. Merely entering the front yard to knock on a door is not trespassing and would not lead to a trespassing defense. The victim was bitten while attending a backyard barbecue hosted by the owner. The victim was bitten while babysitting the owner's children. The victim was a close friend of the owner and bitten after stopping by for a surprise visit. The victim was someone who knocked on the door asking for directions after getting lost. The victim was bitten after jumping a fence to retrieve a frisbee that had accidentally been thrown into the property. The victim was bitten after wandering into a fenced in backyard where he was expressly told not to go, even though he had permission to be inside the house. The victim was bitten after showing up uninvited and threatening the owner of the property. The victim specifically ignored a "No Trespassing" sign. A person broke into the property. Police officers, emergency medical personnel, or mail carriers performing their job duties are not considered trespassers. Trespassing as a dog bite defense only applies to dog bites occurring on private property. However, the property doesn't necessarily have to be owned by the owner of the dog. The law makes no exception for the conduct of school age children. A child can be found guilty of trespassing if he enters an area without the necessary authorization. Even if a victim is found to have been trespassing, it may still be possible to sue for negligence in regards to injuries sustained during a dog bite attack. This would allow the victim to collect some compensation for medical expenses, lost wages, and pain and suffering. To prove a premises liability case involving an allegation of negligence, you must establish duty, breach of duty, injury, and causation. This means you must prove that the owner had a responsibility to act in an appropriate manner in regards to securing the dog, but his failure to do so was the direct cause of your injuries. One example of a case in which the owner may be found negligent is if the animal was known to have aggressive or violent tendencies. Breed alone doesn't make a dog aggressive, but the court recognizes that owners have a responsibility to secure animals with a history of violence towards others. Having a dog in a backyard that is not fenced in could also be considered negligent if the neighborhood is in an area where children are known to wander. Dog owners have a responsibility to secure their animals or take precautions to prevent children from entering the property. If you've sustained injuries in a dog bite attack, legal representation can help ensure that you receive any compensation available under California law. Claims related to dog bite attacks are generally paid under the owner's homeowner’s insurance policy, which means you'll be dealing with an insurance adjuster whose primary responsibility is to keep costs down for his employer. The Inland Empire Law Group is committed to advocating for the needs of California residents who've been injured in dog bite attacks and to help them secure the best possible results. Please call today to schedule a free, no-obligation case review. Appointments are available at our Victorville or Rancho Cucamonga locations.